What is the most unique destination you can imagine for your wedding? 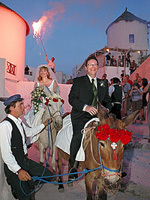 Sara Shuman was married on the Greek island of Santorini. “Think big! You live only once… and when I ask myself what the very best place I can imagine going for my wedding is, I am definitely not going to think of Disneyland,” she said. “People are out of their element and more in the moment. I feel like traditional weddings are hostage situations. People are fighting and everyone wants things to go their way. I don’t like a name tag on a table where I have to sit; my wedding was fun and less traditional,” said Shuman. There are always going to be guests who are not able to attend your wedding and with a destination wedding, that list of no-shows may end up a bit longer, which you have to be willing to accept. While many couples may be upset that some of their friends and family are not there to share their special day, many believe it is a worthwhile sacrifice to create such a memorable occasion in a unique, magnificent destination.You may also need to accept that attendees will be spending more on travel and may not spend as much on wedding gifts. “In an elopement it isn't common for family and friends to join the couple. However, in a destination wedding it is very common. I wouldn't say the wedding ‘lacks’ something if family and friends aren't included, however. It's a personal choice every couple has to make for themselves based on circumstance. Robyn Pollman, president of whollymatrimony.com was married in the French Quarter of New Orleans. “In our own instance, the main reason we decided not to go through with the 'big, traditional church wedding' was that we wouldn't have time on our big day with the close friends and family. Instead, by taking them with us, we weren't just limited to brief moments during one day. We had an entire weekend to celebrate together with everyone. It made it much more special, intimate and memorable,” she said. Sara and Peter spent a total of about $2000 on their Santorini wedding and considered it a significant savings from what they would have spent had they stayed home and had a big traditional wedding. Of course if you opt to pay for everyone’s airfare and accommodations you are going to end up with a much larger bill, not to mention a headache from playing travel agent while in the midst of trying to plan such an important event. Many couples who choose to have destination weddings block off rooms in a hotel and have their guests take care of the rest, and it seems as if most close family members and friends do not object. They get to travel to a unique destination and share their vacation with their loved ones. The wedding is an added perk. An important component of planning a destination wedding is keeping an open mind. Things are not going to be done exactly as planned. You are in a foreign place and part of the delight of traveling is learning and embracing the culture of the place where you choose to spend your special day. “If you’re a person who has had it in your mind what your wedding is going to look like down to the flowers and the color of the napkins then it’s going to be incredibly stressful to plan a destination wedding. You can’t try to control every aspect or you’re going to be disappointed. You have to just leave it to the culture of the country you are visiting. I wasn’t expecting my hair to look a certain way or my floral arrangements to be exactly as I imagined them. Part of the fun of it was just going with the flow,” said Shuman. Wedding planners are also available to help ease the burden of planning a destination wedding. They are able to do everything for you -- choosing someone to perform the marriage; helping choose a location; contacting hair and makeup artists, florists photographers and caterers; and assisting you with the formalities of the marriage. Or, you can just do it yourself with helpful websites that allow you to find cheap airline tickets and hotels. “Whether a destination wedding takes much more planning than an ‘at home’ wedding can depend on the size of the guest list, the location itself, whether or not a wedding coordinator is used (ours helped us get our wedding together in less than five weeks total), the legal marriage requirements of the destination chosen (documents needed, waiting periods, etc. ), and the depth of detail the bride and groom select for their ceremony,” said Pollman. Whether it be a cliff side in Greece, an ice hotel in Sweden, a beach in Fiji, a castle in Scotland, a temple in Thailand, or any other destination, a wedding abroad can be just what you need to perfect your special day. They took their vows beneath the magnificent Santorini sunset. Vibrant colors filled the sky setting the perfect ambiance for the occasion. Guests smiled and cried as the couple was united on a picturesque Greek cliff side that flawlessly reflected the sun. They were married in a poolside wedding overlooking the sparkling river and an old windmill twirled softly above. Brightly colored roses were designed in beautiful bouquets and dusted the ground around the couple. They were led by a procession of Greek musicians strumming on their instruments in honor of the newlywed bride and groom. When the mayor finished speaking, the bride and groom released a handful of balloons over the cliff side to signify the end of the ceremony; it was celebration time. Following an age-old Greek wedding tradition, the bride, Sara Shuman, mounted her white donkey, with red roses around its head, and her new husband, Peter Duke, got on a larger brown one. The warm breeze passed through the couple’s hair as the donkeys trotted through the town’s narrow cobblestone roads. They were led by a procession of Greek musicians strumming on their instruments in honor of the newlywed bride and groom. Fireworks sizzled above sending the energy of the moment into the sky. Townspeople gathered on the streets cheering, taking pictures, and throwing rice and flowers at the couple. “We were like rock stars. It was an unbelievable feeling,” said Shuman. It was a moment never to be forgotten. “It seemed like the world slowed down for a minute- everything was just perfect," she said. The frosty building emitted a fresh, wintry smell. While it was below freezing inside, the warmth of the crowd brought upon the sensation of a perfect spring day. The snow isolated the couple and made them feel all alone in the world, only in the company of their closest family members, friends, and of course each other. Though there was no artificial light, the purity and brightness of the surrounding snow illuminated the room. Katja and Viking seemed to have the right idea. 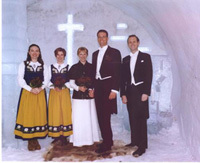 The two were joined together in holy matrimony in the Ice Hotel in Sweden. “The chapel with its cross of clear ice was breathtaking,” said Viking. Music played from a battery-powered CD player, as there was no electricity in the hotel. The snowy walls created the perfect echo to complement the couple’s favorite melodies. “It was a fantastic day! The Ice Hotel with its impressive ice sculptures, the pretty Ice Chapel with simple, but beautiful decorations and last but not least: the happiness of getting married to the man I love in this magic atmosphere, surrounded by all our families and friends,” said Katja. While the groom modeled a traditional American tuxedo, the bride wore Lappish, or Sami boots made out of reindeer fur that were traditional a century or two ago. 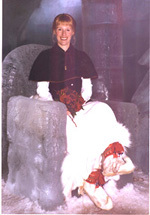 Katja wore a short maroon cape over her gown to keep her warm. The bridesmaids wore traditional Swedish National dresses that the couple rented. The men wore tuxedos with tails, and of course, long johns underneath for everyone. The wedding meal included Reindeer Carpaccio with walnut pesto and fresh cheese, followed by filet of char with creme of lavaret caviar. For dessert, the couple and their guests dined on cloudberry parfait with lingon berries. The Hoglunds and their guests drank from glasses made of ice, sat in ice chairs, created ice sculptures, partied in the Absolut ice bar and finally, thawed out in an outdoor Jacuzzi. Katja and Viking continued their festivities, alone, a few days later, on a honeymoon to South Africa. “Get away from home, do something different! It will be an experience never to be forgotten,” Viking said. Renee and Aaron were married in Fiji on a unique island called Qamea, at the Qamea Resort and Spa, the only one on that island. They got ready in their ‘bures’, or Fijian style cottages. The couple had picked the most beautiful, romantic destination they could imagine. Renee wore a simple white dress, brought to life by the brightly colored Fijian lei around her neck and her red and yellow bouquet that matched the attire of her band and choir. Aaron stood in the warm sand, waiting for Renee at the wedding site. He was surrounded by vibrant green palm trees, under a bright blue sky and the hot sun beat down on his tanned skin. He faced the glistening ocean and listened to the sound of the rippling water as he watched his stunning bride glide toward him. The couple was united in a remote area of Fiji where very few tourists travel. “The island has six traditional villages, and villagers live like they did 200 years ago. The island is completely unspoiled,” said Renee. 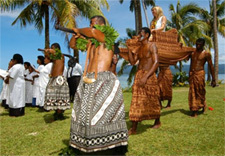 Having the Fijian villagers in attendance was the perfect touch to top off their wedding. "Aaron and I love the beauty of Fiji but mostly the sweetness and innocence of the Fijian people. We felt that getting married at Qamea would be the closest place to paradise on earth, surrounded by people who are some of the warmest and friendliest we had ever met anywhere," Renee said. Renee was carried down the beach in a chariot by six Fijian warriors. She was welcomed by a five-piece band, and a 12-member choir, not dressed in tuxedos and gowns, but instead wearing bright blue and red flower print shirts to blend in with the vivacious scenery. Making quite the entrance, Renee and Aaron took their vows as Aaron’s long, loose curls flowed behind him in the wind. He wore a Fijian chief’s costume made of traditional Tapa cloth in a bold black, brown and white pattern. His outfit coordinated with the skirts of the warriors and was offset by the brightly colored leis around his neck and arms that matched his bride’s. The two exchanged rings, and their marriage was made official by a minister in a traditional Christian service, followed by a spiritual Fijian ‘Kava’ ceremony, featuring the country’s ritual music and dance, and a special Fijian beverage. Following the service an entire tribe sang and danced for the bride and groom for a whole hour. A guest appearance from a famous Fijian folk singer, Jale Mareau, was the perfect surprise and he sang a special song to the couple to make the day truly enchanting. The day that Jeff Prosise and Grisel Gonzalez arrived in South Ayrshire, Scotland, the sky was a crystal blue and the bright orange sun sparkled above. The couple was thrilled with their wedding location and could not have imagined changing a thing. 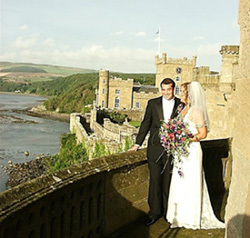 The three-story castle was magical, and the ocean below was exactly what the couple had imagined. “I remember a lot of deer on the castle’s property. The deer came right up to us and we pet them and they nuzzled our hands, and I remember the gorgeous gardens… I was especially drawn to the armory room in the castle. All types of weapons lined the walls in really cool patterns,” she said. However, the next morning when they woke up on their wedding day the sky had changed from an inviting blue to an ugly, unwelcoming grey. The once cloudless sky was packed with a thick haze. As the two arrived at the castle the sky opened up and it began to pour. Disheartened, the couple went their separate ways to get ready for the ceremony. The round salon was prepared with Scottish wildflowers. The smell of lavender drifted through the castle. About ten minutes before the ceremony began, the rain stopped and the warm sun and blue sky that the couple had wished for returned. “If it’s lucky to be rained on, then we got it and if it’s lucky to have a wedding on a sunny day, we got that too. So, no matter what, I consider us lucky,” said Grisel. When the wedding was over the couple and their guests took pictures on the castle’s balcony overlooking the water, and then took a long walk on the beach. It began to drizzle and as the couple got back into the car to return to their suite in the castle, it began to pour again. “Somehow, for that two hours, miraculously it was beautiful and clear,” Grisel said in tears, recalling her special day. To get to Malta, you have to travel through a European city, so the couple chose London and decided they would get married there, but after researching marriage laws, they realized that a 21-day residency period was required in order to legalize a marriage in England. Jeff and Grisel ended up driving to Scotland, chauffeured by a Scottish wedding planner they had found online. He had helped the couple find the castle near the water where they wed. The couple chose Culzean Castle for its charming surroundings, and their ability to spend their wedding night in the actual castle. Because they had planned their wedding in such a short amount of time and were not able to provide a lot of notice to their friends and family, few were able to join them in Scotland. But after their honeymoon, when they returned back home, the newlyweds prepared a beautiful reception in California for their friends and family that could not make it to the actual wedding. “We also brought him some offerings from home; a pot of Alex's mom’s homemade marmalade and some shortbread from Scotland. After that, we released nine birds from a basket and nine fish into a local river, again for merit making,” explained Eleanor. Mid-afternoon, the four headed to Jit's new, traditional teak house in Doi Saket, just outside of Chiang Mai, where the main ceremony was held. “I waited inside the house. I wasn't quite sure what was happening, but I could hear a very noisy procession of whooping and celebrating as everyone made their way to the house. Alex had to pass through a series of three symbolic gates (made of rope), each of which had a gatekeeper. The gatekeeper's job was to ask Alex questions and generally give him a hard time before he passed each one. In return, he had to give each one an envelope with some money inside. Traditionally, if the gatekeepers are not happy with the answers (or the money they receive), they can block the way for the groom, thereby not allowing the marriage to proceed. Fortunately, all was ok for us!” Eleanor said. “Getting married in Thailand was very reasonable for us and good value for money. Some big chain hotels in Thailand offer weddings at inflated prices, which are probably rather cheesy. 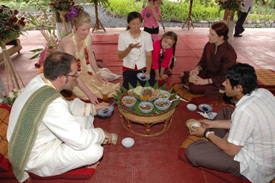 Jit's company Northern Thailand Weddings offers something much more personal and traditional,” Eleanor said.